The day in late March started like most for Craig Martin. With his kids at school and his wife off to work, the 48-year-old Parker resident jumped on his elliptical for a workout. When Martin’s family moved to Colorado from Los Angeles in 2012, they did so in part because of their passion for the outdoors and commitment to a healthier lifestyle. Martin, a remote programmer analyst who spent a good chunk of his day staring at a computer screen, was committed to staying in shape in preparation for a multi-day backpacking trip in April. It did get worse. “Rather quickly,” he says, adding, “there wasn’t a lot of ambiguity there.” So Martin, who’d read that the “No. 1 factor for survivability” during a heart attack was getting quick medical attention, called the paramedics. After treating him at home with aspirin and nitroglycerin and performing an EKG, they rushed him to Sky Ridge Medical Center. 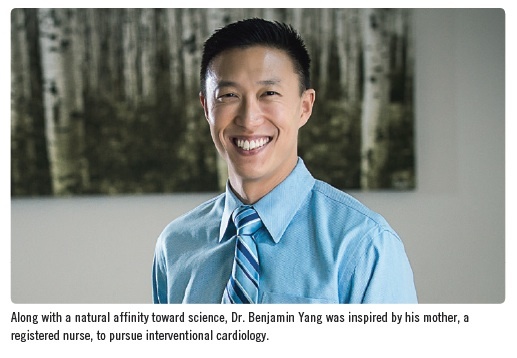 There, Dr. Benjamin Yang, an interventional cardiologist, would perform a procedure that would have Martin home in two days and back to his regular activity level in less than a month. Because he has a family history of cardiac problems, Martin wasn’t all that surprised by his heart attack. What he was surprised by, he says, is how quickly he was back home and going on with life. 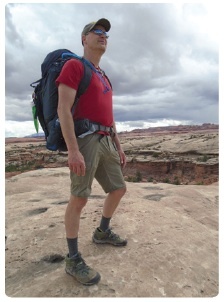 He went car camping a week after the procedure and, a month later, backpacked for four days in Canyonlands National Park. He attributes that in part to Dr. Yang — “I feel very fortunate that I found a doctor at Sky Ridge who was up on the latest technology and medical procedures,” he says. The transradial approach is performed through radial artery access, it means your doctor will use the radial artery in the wrist as the entry point for the catheter. The cardiologist threads the thin catheter through the body’s network of arteries in the arm and into the chest, eventually reaching the heart. Transradial cardiac catheterization (wrist) offers a less invasive, lower-risk option compared to traditional femoral artery (leg) access for cardiac catheterization because the procedure is performed through a small artery in the wrist rather than the groin. The radial artery approach (wrist) is safer for patients as it is associated with less bleeding and fewer complications compared to the femoral approach (leg). When would you potentially need a cardiac catheterization? If you have symptoms of heart disease but are medically stable, your doctor may suggest cardiac catheterization as an elective procedure to check for blockages in the coronary arteries and to evaluate how well the heart’s main pumping chamber is working. In a recent issue published in the journal Heart researchers compared transradial (wrist) versus transfemoral (leg) access by analyzing data from nine previous studies involving nearly 3,000 STEMI patients undergoing cardiac catheterization. What they found was that transradial access during coronary intervention (PCI) cut mortality by 47 percent, and major bleeding complications were reduced by 37 percent and access site complications by 70 percent.